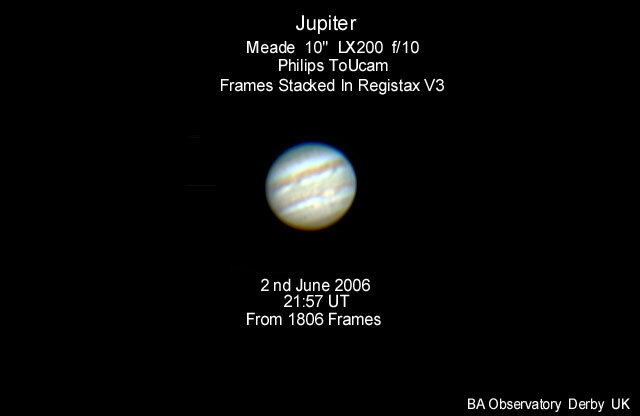 The following three images of Jupiter were taken by Barry Ashforth in June 2006. The Great Red Spot is clearly visible in all three. Jupiter is just visible as a faint speck in the upper left portion of this picture of sunset over Perinporth, Cornwall, taken on the 3rd August 2006 by Simon Allcock using a Fuji Finepix A330 Digital Camera. 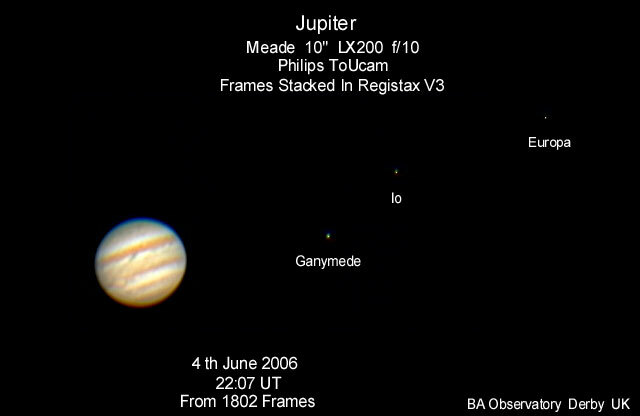 Chris Newsome took the following image of Jupiter on the 4th July 2006. The image comprises 48 frames taken with a Meade LPI camera through a Celestron C8-NGT. The images were stacked in K3CCDTools v1 and then processed in CS2 using an unsharp mask, duplicate layers, high pass and overlay to try and bring out what detail there was. 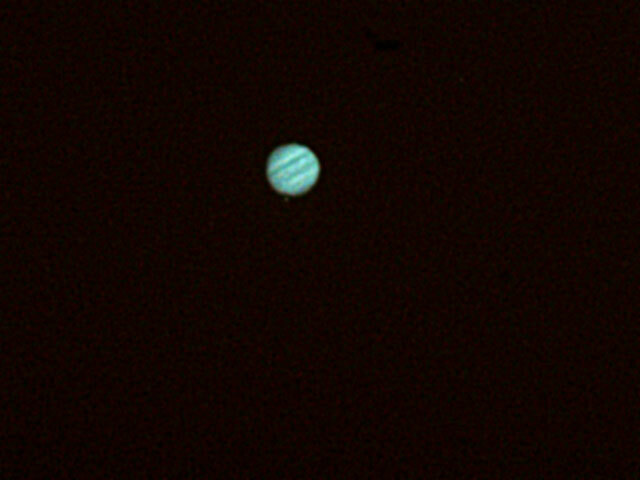 The following image of Jupiter was captured by Chris Newsome on the 3rd July 2006. The image was taken using a Meade LPI camera through a Celestron C8-NGT and a 2x Barlow. The image is comprised of 156 frames stacked in Meade Envisage software and then processed in CS2. 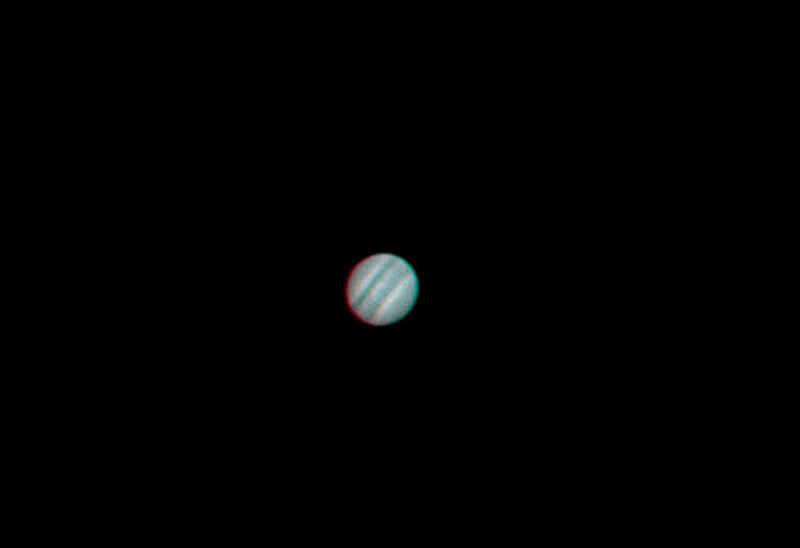 Chris comments: "Have you ever wondered what Jupiter looks like through a bowl of jelly? The atmosphere was incredibly unstable with constant thermals (the daytime temp had been around 28-30 deg C) hence it was difficult to image anything - even visually it was difficult to see the North Equatorial Belt and the South Equatorial Belt on the disc. If you look closely on the bottom edge of the disc you will see a speck - that's Ganymede which had just emerged from eclipse by the planet". 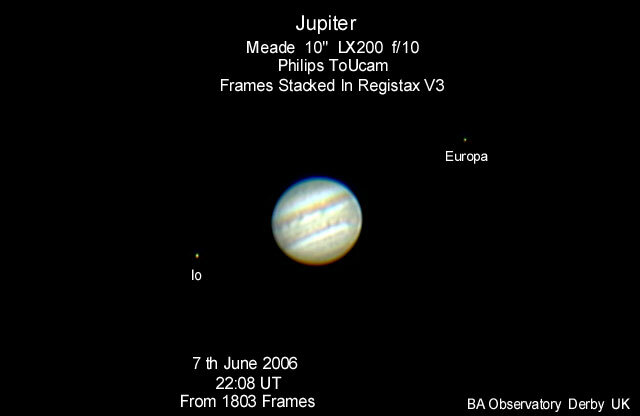 Chris Newsome captured the following image of Jupiter on the 8th June 2006. The image was taken using a Meade LPI camera through a Celestron C8-NGT and is comprised of 300 frames stacked in K3CCDTools version 1. 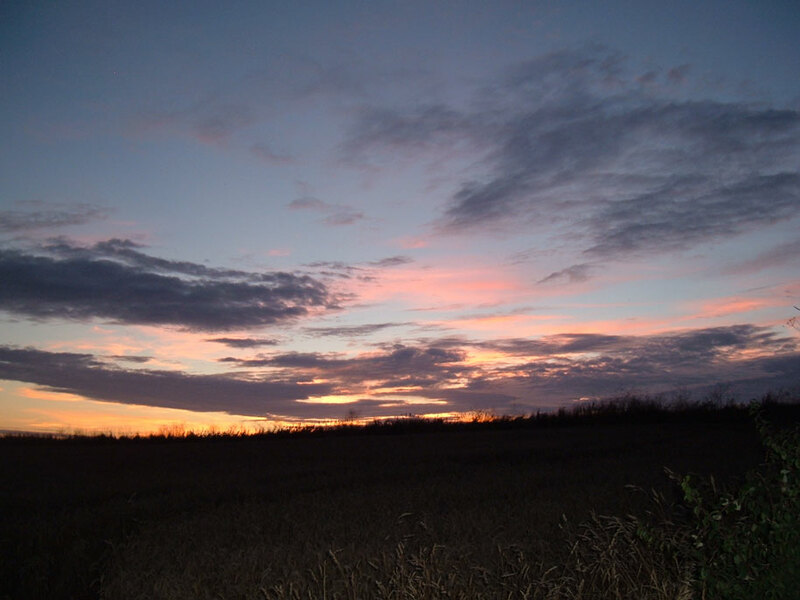 The resulting image was then processed in CS2. The shadow on the top edge of the disc is from the Jovian moon Ganymede, which itself can be seen above Jupiter. Chris comments that "Jupiter were very low down in the sky and, bearing in mind the heat of the previous day, the atmospheric turbulence was horrendous - it was like looking through a jelly! However the stacking process has helped in eliminating the atmospheric effects to a certain extent although the overall image is still blurred". Looks fine to me Chris - webmaster.